Designing Sound: First of all, tell us something about your passion for cars, and what you enjoy most about working on Need For Speed Games? 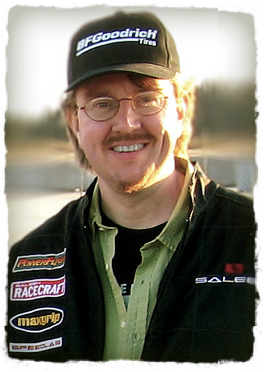 Charles Deenen: As a kid I played a lot with toy cars, build lego race-tracks and liked anything associated with speed. In the netherlands you can’t start your education for a drivers license until you’re 18. Before I started that, I got my speed-kick out of BMX biking, competing and doing jumps too high for my own health (the hole in my tongue is witness of that :) Oddly enough I’d always told my family I wasn’t ever going to drive a car. I’d seen one burn down during younger years, and was afraid I’d get burned alive in a crash. But hey, that fear didn’t last long, and I obtained my drivers license quickly and have always driven with a lead-foot. Before “Need for Speed”, I’d never worked on a “big” racing game. Previously I’d worked on some C64 and SNES racing titles, but in those days sound was a low priority in a racing game. Heck, we were happy enough it made some tolerable sound. On the Need for Speed franchise I’ve always enjoyed the people I work with the most. Without a team driving each other to excel, you don’t get industry leading results. We’re blessed to have that team in place. The execs at EA understand what great audio brings to a title and support the development of it. The other aspect I enjoy is the constant drive to find new and better ways to give the user a true car racing experience. This includes the plethora of cars we have to record (and sometimes get to drive :) which is always a really fun but exhausting time during the dev-cycle of a title. Having worked for many years on slower RPG style games, the racing genre changes up the pace nicely by introducing constant action. DS: How has the evolution of the franchise been? What are the main improvements on the game since the first version? CD: Need for Speed has been around for over 16 years(!! ), and the very first version was 1994’s “need for speed” on the 3DO, with audio by Allistair Hirst. A lot has changed since then, but the platforms are so different, it’s hard to compare what the main improvements are. The previous games always have sounded great for the platform limits. The new consoles have allowed expansion of the realism of the sound, and provide a more engaging and believable soundscape. New playback techniques got introduced during 2004 on NFS Underground 2. Air distortion, split engines and environment integration were introduced in 2007. We’re now working on something that will bring it to another level by making the car come alive, which I’m very exciting about. No other game has done this yet. When this gets released it’ll be another few years hopefully before the competition will catch up. DS: How is the relationship of the sound team with the rest of the developers of NFS? How is the importance given to the sound of the games? CD: The development team and NFS management realizes that Audio is a critical part of a racing game, and supports it. The audio artists and audio programmers are among the development team, and interact daily with the rest of the team. In other words, there’s no real separation between “sound team” and “dev team”. Everybody is part of the whole team. DS: What techniques or methods you use on the game to enhance the player experience and provide realism/emotion with sound? CD: Over the years we’ve tried several methods. Some that worked well, some that didn’t. Through all this we noticed a few interesting points. First off, the consumer thinks they know what a great race-car sounds like after listening to youtube clips. 2nd, the consumer still listens to racing games mostly on TV’s at low volume. As much as us developers want to believe they listen to games at higher volumes in 5.1, it simply isn’t the norm. Over the years we’ve changed our ways and style of mixing (using our advanced fully automated mixer), and tried out new techniques of sound reproduction. Some methods tried to make the experience go towards a movie by focusing on the most predominant sound requirement (i.e. focused mixing), while other methods involved a more defined car experience or putting you in the world. Music and dialog treatments have gone through several phases as well, with cop dialog being some of most believable you’ll hear in games (as mentioned by other people). All in all, we tried out a bunch, focus-tested, and then awaited the consumer’s response. Not all stuck :) What did stick are the elements which made the consumer less aware of audio as part of the game. The more audio works together with the experience, the better the result. The moment the consumer notices audio, it starts to work against the game experience. This all ties back to one of the articles we touched upon before; the believability gap. Audio can be a major offender in that area. How often have you heard a song stop/start on a racing game with “radio station” music treatment? It takes away from the smooth gameplay experience since you notice the audio being a layer on top of the game. So instead of focusing on the latest cool audio techniques, we’ve gone back to the basics for future titles. The goal is that users won’t notice audio, but the moment they play the game silent, they notice their experience diminishing greatly, or even impossible. DS: You also worked on Fast And Furious films… Any influence of NFS there? Did you learned something on the films that you implemented on NFS later? CD: The fast and furious films were all about hot (tuner) cars, flashy body-kits, neon etc. It was a car culture considered very hip during the early 2000’s. Naturally NFS follows, and sometimes trend-sets this culture. During “underground” and “most wanted” NFS’s, there was quite a bit of audible cross pollination between NFS and the furious films. Even if I hadn’t worked on both, this would have most likely happened, simply due to the culture cross-overs. What I learned during the Fast/Furious films was how to create the emotion of car sounds projected by other sounds. We used a plethora of bears, pigs, tigers, leopards etc. to enhance cars in a layered, or sometimes standalone way. Each character in the film got their own “treatment” and style. On the NFS side, we always started with the car recordings as a base, but on cinematic moments we’d enhance them with various other layers. During the early 2000‘s we used to go for animals and metal. Now we’re more into the distortion/synth sweeteners as you might have heard in the cinematics of NFS Shift. Also when working with some great sound designers/editors in the world, you always pickup new ways and techniques of creating sound, which naturally get used in future titles. DS I think you’ve had a lot of fun recording all the cars stuff (engine, inside car, skid noises, impacts, etc) for the game?…Could you share some experiences on that? CD: We’ve had a lot of fun on all these recordings. They are some of the best times we have on a project. Over the years we’ve changed our recording techniques in search of methods which made the cars come alive. We used to record cars by placing them on on a dynamometer, but this gave us a pretty “stale” lifeless sound (perfect for programatic, scientific cars though :) Now most of our recordings are done on a track, with dyno recordings filling in some gaps. We employ some of the best car recordist to ensure we get the result we need as there’s only 1 opportunity at times. As always it’s a team effort. For NFS we’ve recorded 150+ cars, anything from regular to high end 1 million dollar race-cars. Each of those is a new experience as you always have to find the optimum recording spots. Besides that we’ve done car crash recordings in multiple ways, several sessions of skid recordings, road surfaces, bumps, turbos, rattles etc. You name it on a car, and we probably recorded it. There are a few sessions that always stick out as really fun or interesting. One of them being the “Touge” research. For one of the NFS, we added a mode which was a craze in japan called Touge. It involved going through mountain roads incredibly fast, drifting the cars. We hooked up with a crazy touge driver in L.A and recorded a lot of reference material, both onboards as well as exterior. Lets say that a human is not meant to go so fast on those mountain roads. It was absolutely insane. The dozens of skid-marks on the road, trailing into the deep valley are proof of that. Too many got into accidents there. Another fun trip was a few days of recording at Sebring. Jesse Lyon connected with a few racing teams running in the GT1 class like the Corvette Racing team and we ended up having full access to their cars for a day each. We were initially not prepared for 130+db cars. These were the loudest cars I’d ever heard. However, John Fasal pulled a few tricks out of his sleeve and we ended up recording 3 magnificent cars those days with a team of 4 people. Everybody loves crashes. We’ve done several crash recordings, but the most elaborate one has been the hiring of a construction crane, dropping cars 100 foot down. We went through about 15 cars that day, and dropped anything from cars, vans, huge cement blocks to metal beams onto various items. Every time we did this, we stuck an SM57 in the middle of the crash, at impact point, thinking it would die after 1 time. After 40+ drops the SM57 had a minor scratch on it. Go figure. It simply didn’t want to get killed. DS: And what about the ambiences? CD: We do ambience recordings when needed as NFS isn’t an ambience heavy game. We’ve been to many race-tracks, city races, drag-races, drifts, bridges, tunnels and other locations that we’re set for some time to come. DS: I love the cinematics of every NFS. You directed some of them, so how is the sound design approach on that animations? CD: The cinematics are always done by a team of people, and on most NFS since 2003 I acted as one of the principal sound designers and/or sound supervisors and/or mixer for the cinematics. The cinematics are usually hard to do as they come in at the last moment, have to integrate well with the game, and have to flow smoothly in and out of the game. On average, each NFS has between 20-45 minutes of movies. Over the years several groups and post houses (Danetracks, Warner Brothers, Sourcesound, Soundelux etc.) have worked on these cinematics and each have given it their own flavor. The approach we use with editing is not really any different from a feature film. We usually start off with a design concept to establish what the general feel should be. Often this has been preset by the game already, so the movies follow that path. We then find a post house, or group of individuals who can take that concept and make it their own. The sequences get spotted, sound edited, designed etc. The team usually has a principal sound designer, several sound editors, a musical editor/designer, FX recoridst(s), foley artist and re-recording mixer(s). When editing is about to finish, the premixes start, and after some design tweaks, followed by the final mix. These sequences are usually some of the hardest to mix, as so much is happening. 2 years ago we started to work with Tom Ozanich who really understands this, and does a fantastic job mixing the majority of the ingame cinematics. DS: Another great feature on the Need for Speed series is the implementation. How is that process done? And what about the audio engine used on the game? CD: On NFS we use the majority of EA’s tool-set; AEMS, Pathfinder, Renderware Audio etc. 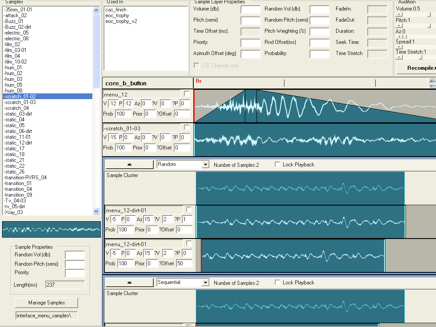 Beyond that the NFS team wrote their own mixing tool starting in 2004 which also has been used in numerous other titles (Skate, FiIFA, NBA street etc.). This tool can modulate over 2000+ parameters each frame without eating up much CPU and acts as an interactive dub-stage equivalent. It was developed by John Twigg and Cliff Kondratiuk. It is still in use today, but in the next few months will be replaced with a more refined version. Splicer is another tool written by the NFS crew. It basically can read Protools sessions and allows very quick multilayer sounds to be created. 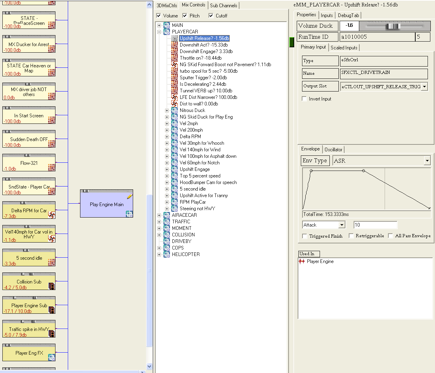 Aems is our MAX/MSP equivalent runtime. Originally developed during the SSX years by EA Tech. NFS audio programmers recently wrote a new interactive music tool, taking full advantage of beat-matching, overlays, multi-tracks, animation-matching etc. This will be used in a future NFS. We also have a proprietary way of playing back car audio. This was developed by Patrick Ratto. It’s been our work-horse since 2004 when the first review on NFS Underground 2 (official U.S playstation magazine) read “The sound effects are without any shadow of a doubt the most amazing I’ve ever heard in a videogame. The rasp of the engine is so unbelievably believable that you can actually feel the reverberation of the exhaust as the ower surges through it. It will change your expectations of what a game can sound like”. Now this engine is in it’s 3rd version, and we’re doing a re-invention on it. Most games are still working on refining car audio sound reproduction, we’ve moved into making the cars’ audio come alive, be real, be as expected. We’re using a whole new tool-set for this, and some magnificent audio artists. DS: And what you can tell us about the dialogue? There is a particular way to deal with this on NFS? CD: The majority of our dialog has been Cop Dialog. During NFS Most Wanted we came up with a new way of recording dialog which was the breakthrough for that game. It added a whole new layer of realism which carried on through Carbon and Undercover. During GDC and other events, people still ask me how we’ve done this, and I smile :) Last year, Audio Artist Phil Hunter did a lecture during GDC about this and explained the simple, but very effective method behind it. That said, to us this method is now a bit of a has-been. We’re looking for the next solution; how to get great, instantly believable performances out of actors without making them sound gamey. So far we’ve had some good results, but also found a hundred ways on what not to do. As previously mentioned I think this is where gaming will get to their next incarnation; believability. That’s our main focus now. Gaming in general needs to move on, and leave the saturday morning cartoon performances behind. CD: For next gen consoles we’re not going to say “no” to more ram, and more DSP. Our awesome NFS audio programmers always find a way to make use of every little bit of CPU or ram left over. That said, graphics in general on games have to catch up to audio to overcome the uncanny valley effect, so a better graphics processor is in dire need. Need for Speed is continuing strong. We’ve listened to the consumers and EA has put in great effort to turn the franchise around. The next few releases should really show this. I’m very excited about it. It feels like the re-invention that happened during NFS Underground. Everybody was stoked about that game. That same feeling is coming back, in a big way. As for sound, we’re doing the same; giving multiple spins to audio and car reproduction. Each game will feel very different. Even though we might share the sound recordings, each game has a totally different way of processing and implementing this. Hopefully consumers and sound peers will enjoy the next generation of NFS as much as we enjoy making it. I loved all the pictures but otherwise this interview felt more like a lot of bragging. I like this website because I get to learn from the best in the business, this interview gave me next to no insight in how they actually make the game sound as good as it does. If you don’t want to share any secrets or tips than don’t sign up for doing an interview. Still love the site though! Hi Alden, I’m sorry you didn’t get anything out of it. I believe the questions were answered honestly. Nobody forced you to read it you know? But maybe this might help you a bit more; http://designingsound.tv/need-for-speed-the-run-capturing-the-sound/ (there’s 4 parts to this video series). Maybe not, who knows, maybe you see that as bragging too.